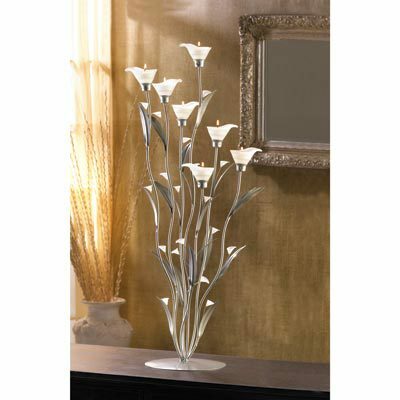 12794 Silver Calla Lily Candleholder home decor, jewelry, decor, decorations, electronics, fountains, floor mats, art glass, vases, garden essentials, fireplace screens. Weight 4.6 lbs. Iron, glass and acrylic. Tealight candles not included. May Require Additional Freight Charge. Some Assembly Required. 11 1/2" x 8 5/8" x 32" high.